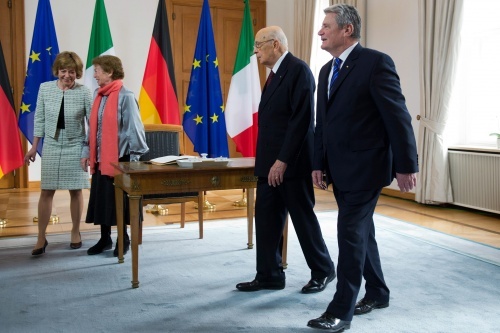 In pictures: Italian President Giorgio Napolitano (2-R) is received by German President Joachim Gauck (R) at Bellevue Palace in Berlin, Germany, 28 February 2013. Gauck`s partner Daniela Schadt (L) and Napolitano`s wife Clio to the left. Italian President Giorgio Napolitano (2-R) is received by German President Joachim Gauck (R) at Bellevue Palace in Berlin, Germany, 28 February 2013. Gauck`s partner Daniela Schadt (L) and Napolitano`s wife Clio to the left.